Opened in 2001, The Shaanxi Provincial Art Museum is one of the largest modern art museums in China. It is located in the city of Xian and is funded by the Shaanxi People’s Government as a public utility and socio-cultural organization. Covering a floor area of 12,000 square meters, the museum has an exhibition area of 7,600 square meters. 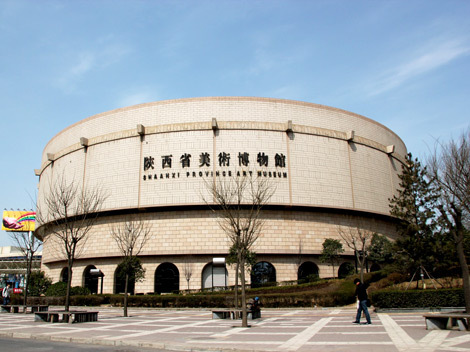 The Shaanxi Provincial Art Museum is dedicated to collecting and protecting, displaying and exhibiting, studying and researching, and selectively exhibiting Chinese ancient art relics, contemporary and modern masterpieces, excellent works of contemporary artists and folk art from Shaanxi Province, and conducting cultural exchanges with other countries as well as providing cultural services. The Museum also permanently displays the contemporary excellent paintings and calligraphy of Shaanxi . Each year, more than 60 art exhibitions are held, attracting over 400,000 visitors.